"Batman: Assault on Arkham" Animated Movie Review! You are here: Home / Reviews / Comic Book Movies / “Batman: Assault on Arkham” Animated Movie Review! “Batman: Assault on Arkham” Animated Movie Review! 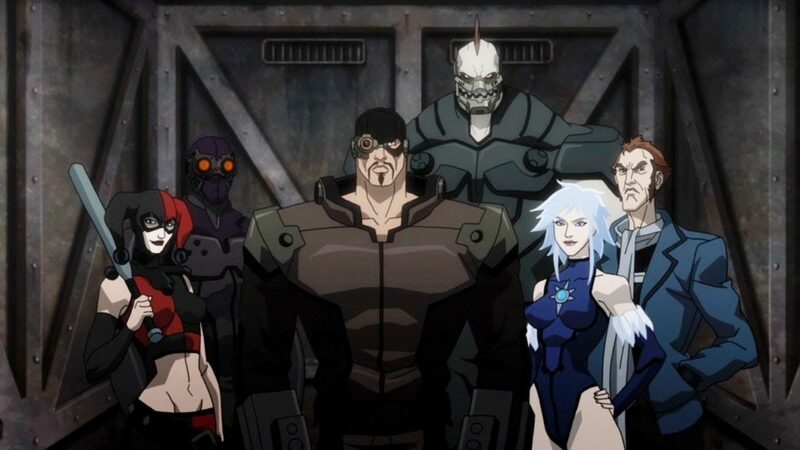 “Batman: Assault on Arkham” is the latest film in the DC Animated Universe series. The film is based off the popular “Arkham” video game series (Arkham Asylum, Arkham City, Arkham Origins, and next year Arkham Knight). The film actually takes place between two of the games (Origins and Asylum). The story follows Batman (Kevin Conroy) as he faces the “Suicide Squad” and the Joker (Troy Baker) during a deadly night in Arkham Asylum. Despite the film taking place in Arkham it does not concentrate on the Dark Knight. Much of the film actually focuses on the Suicide Squad and their attempt to infiltrate the Asylum to find a thumb-drive in the “Confiscated Items Room.” The Squad is a group of rogues who are recruited by government agent Amanda Waller to go on particularly dangerous missions (in order shave off years in prison), hence the name “Suicide Squad.” The group consists of Deadshot (Neal McDonough), Killer Frost (Jennifer Hale), Black Spider (Giancarlo Esposito), Harley Quinn (Hynden Walch), King Shark (John DiMaggio) and Captain Boomerang (Greg Ellis). Jay Oliva and his writers clearly knew which characters to pick in order to give the group depth. For example, Deadshot and Boomerang have a constant alpha-male battle as each tries to “one-up” the other, which creates a conflict within the group. Waller and Batman are on different sides of “the law” and “justice.” Deadshot, a merciless killer merely wants to see his daughter again. Harley Quinn, like her New 52 counterpart, starts a romance with Deadshot, only to run back to the Joker. These little sub-plots give the story and characters more dynamics in how they deal with each other and their situations. The writers also include little homages, “easter eggs” if you will, to the Arkham franchise and the Batman Universe. For example, Batman throws Bane into Gotham Bay as he does in “Arkham Asylum.” Penguin is a gluttonous mobster gobbling down a pile of raw fish as he does in “Batman Returns.” The island itself is filled with nods to characters from Poison Ivy and Mr. Freeze, to B-listers like Maxie Zeus and Killer Moth. Even still, these anecdotes are fan service and serve for little else. Unfortunately, the positive attributes of the film end here. While the characters are well crafted the story quickly becomes convoluted. Waller recruits the Squad by placing nano-bombs in their heads as a means of controlling them. They are sent into Arkham to find Riddler’s Staff (which holds the thumb drive) in an “Ocean’s Eleven”/Heist Film scenario. The film rarely focuses on Batman, rather making Deadshot the center of the story, and focusing on his attempts to control this band of rogues and dueling the Joker (who has no purpose besides fan-service) in a helicopter. Without giving too much away, the story has too many twists and turns for a seventy-five minute animated film. It does not come off as a “Batman” movie but rather one about the “Suicide Squad” where Batman appears. I give it credit for trying to do something original, yet it would have been more successful if it used the “Arkham Asylum” formula. Give it a watch and let me know.